Let's face it, as much as you hope and pray that New York, LA, and SF will one day be affordable, it's just not going to happen. But, don't forget there are other fair cities in the US, many of which you can maybe actually even live in without going into debt. What a concept, right?! Forbes has released its list of the most affordable cities in the US in 2015, so you don't have to keep throwing out piles of money. It took the country's 100 largest Metropolitan Statistical Areas (MSAs) and Metropolitan Divisions (MDs) -- all with populations of 600,000 or more -- and examined cost of housing, food, utilities, gas, transportation, medical expenses, and other daily expenses in each area. 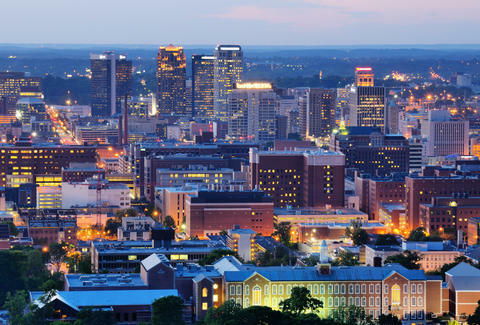 The most affordable city -- which, if you're a reasonable person who enjoys holding onto hard-earned money, you should probably start packing for immediately -- is Birmingham, AL. Knoxville, TN comes in at no. 2, followed by Buffalo, NY (which is probably the closest you'll get to your big city dream, but be prepared to utter the phrase "I'm from New York. No, not the city" forever). Unsurprisingly, the list is largely made up of cities in the South and Midwest. The West only made it onto the list once (Colorado Springs, CO came in at no. 11), and the same goes for the Northeast (Buffalo, NY at no. 3). And as for the West Coast? None! Leave, now. Lucy Meilus is a staff writer for Thrillist. She lives in New York City because she has an affinity for throwing out piles of money. Follow her into debt @Lucymeilus and send news tips to news@thrillist.com.